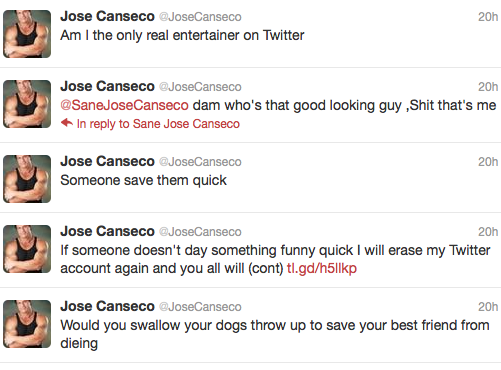 Yeah, we aren't making up this stuff that Jose Canseco is saying - he really does write it himself. It's like a bad car crash on the highway. Can't stop looking at it. This from the mind and twitter account of Jose Canseco. I’m trying to imagine the scenario. It should be easy: I’ve got a dog and a best friend. First, let’s consider the wording. We only have to swallow the dog vomit, not chew it or anything like that. It would save my best friend’s life. Wait, what am I doing? I’m not going to analyze this. What I want to do is point out how the Canseco story should have gone, how he should have been remembered. Let’s start with his career. Before his steroid use became the only thing we associate with him, Canseco put together one of the greatest seasons in Major League Baseball. In 1988, he became the first 40/40 man in MLB history, notching 42 homeruns and 40 stolen bases. He also had a .307 batting average and 124 RBI for the Oakland Athletics. Only three other players have completed a 40/40 season: Barry Bonds, Alex Rodriguez and Alfonso Soriano. Not only was Canseco the first to do it and win the AL MVP that season, but he can lay claim to inspiring Jay-Z, who opened his 40-40 Club in New York based on this rare baseball accomplishment. Even though we now know he was taking steroids at the time, for me, it only slightly diminishes the feat. Put an asterisk beside it, it’s still impressive. His career included a championship and several accolades (also a few lowlights), but then came the release of his book Juiced in 2005. He admitted to using steroids in the book and outed several other players. He essentially blew the top off the steroid era in baseball, making the use of an asterisk in the record books common place as well as setting in motion God knows how many commissions and trials on the subject. His behaviour just got increasingly weird from there. The highlights include: taking a shot at mixed martial arts; boxing Danny Bonaduce; and starring in VH1’s the Surreal Life alongside Perfect Strangers Balki Bartokomous. What all this did was detract from one fundamental thing – Canseco was telling the truth about steroids and baseball. Several of the players he cited in the book either admitted their wrongdoing, were caught by drug tests or are contesting the claims in court. If Canseco hadn’t had this wild and bizarre life post-baseball and simply written Juiced, we would we see him in a different light. Sure, there would be some who would condemn him for shining a light on an ugly truth, but I suspect more would see him in a positive light. So the question becomes: Jose, will you stop eating metaphorical dog vomit on TV in order to save the last bit of credibility you have?